Demolition Master is a 3dsmax tool based on Thinking Particles for make quick, and easy destructions. I provide a 3dsmax scene, with Demolition Master on it, all debries already connected and FumeFx setup. All thinking particles parameters are exposed on modifier panel, so you don’t need to know Thinking Particles workflow. All are advantatge in a full particles setup, particles change from one rule to another. You change parameters in real time in any frame and all your animation is recalculated. Delete geometry frags or debris based on his position, create procedural geometry. Demolition Master uses Thinking Particles dynamic solver, more solid and stable than physx, with concave and convex objects enabled. For Demolition Master you need 3dsmax 2010, 2011,2012 or 2013 with Thinking Particles 5 installed. FumeFx is also suported but not necesary. Concrete, wood, glass and steel materials with specific parameters. Full destruction control, fragmentation objects pass diferent states with diferent frictions defined by user. Instant debries creation (splashes, trails, impact debris) for concrete, wood, steel, glass materials and bullets. Thinking particles Tool, so you can refine all parameters for your needs. TP dynamic solver presets, choose quality/speed, concave and convex objects suported. Activators, choose what you want to destruct. Bullet physics New in 1.6! Use proxys to accelerate dynamics/viewport speed New in 1.6! Demolition Master come with two versions, Demolition Master Lite (DM Lite) and Demolition Master. DM Lite is free! I decided to keep one version very simple with principal needs, the most used materials, basics debries, and simpler controls. Now updated to version 1.6 with procedural joint system, bullet physics, export options and more! 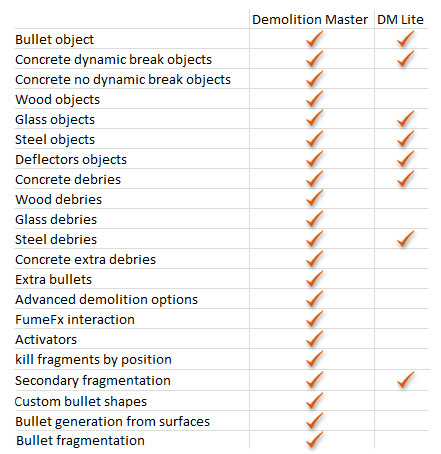 If you try DM Lite and you like it, consider to buy Demolition Master, with full control over your destructions. Also you are helping me to improve DM and make more tutorials. IMPORTANT: You can still buy demolition Master from andvfx.com. But we strongly suggest to buy it from effectivetds.com You will get the same file, but with a more modern onlinestore, plus you can access your download file at any time. You can pay with paypal or credit card, check that email introduced in paypal is correct. Once the payment is complete you will receive a email with Demolition Master in a few minutes. Also DM updates will be send to this email. Please dont demolish our strong desire to use this. Give it to us for “Blessed are those who give for they shall enter the kingdom of Visual effects”. I have a question : will this TP setup be compatible with the Cinema 4D’s TP particle system too (i see your used only 3DS MAX in your demo..) ? Thanks! Sorry but no, Thinking Particles for cinema 4d its very old (version 2) this is for TP4 (now its out TP5), and has features not available for TP2, like volumebreak that its used to dinamic break elements. This tool looks so fantastic, I really cant wait to try it out, I am willing to pay for it, no questions asked! Do you know when it will be ready to download? Thanks! It’s production ready, I’m refining some things and making all the documentation, I hope in two weeks if there is no problem. Wow, thats sounds really good Eloi. This is one of the tools I really can’t wait for and been looking for a long time. Do you know if it will work on tp5 aswell? Big thanks for your hard work with this tool, really amazing! Thanks Stefan. I hope it will work on tp5, but I have to try it. @Maik – Read above, he said “I hope in two weeks if there is no problem”. I will for sure donate you some money for this tool. Looking forward to try it out! Thanks for your great effort! Hope to see DM soon aswell, thx for your great effort! I have some works now, so little free time to finish it. I need some time to finish one tutorial for the releasedate. I hope in two weeks. Thanks a lot for your interest! Agree Pengo but you can’t compare TP with RayFire, TP is a whole other level and makes RayFire looks like something the cat draged in. Does it work with 3dmax 2013 x64 and TP5, Since TP4 is not supported in 3dmax 2013 x64. I couldn’t try for myself. But Stefan comented that is absolutely compatible with TP5. Hi Eloi, this tool looks awesome! I´ve downloaded DM Lite, sadly dosn’t work for me, i have 3DS Max 2011, i don´t know why… any suggestions? Thanks in advance!! You have Thinking particles 4? Hi, I am trying to use TP 4 (MAX 2012) and notice that I can’t (or I don’t know how) apply UVW mapping coordinates to the broken pieces. Is your tool fixing this problem? Thank you. Hi, you need to add the uvw map to your orignial 3d object. A limitation of Thinking particles is that you couldn’t add more than 1 uvw map. Instead you can use a multiple procedural map for your broken sides. Hi…….. how we can bake a final simulation ??? I want to export it to Maya for example. For bake the animation you can open the Thinking particles ui interface, add a Demolition master group and send all to an export node. In the upcoming version will premade it. All the particles will be baked to geometry on scene, you can export this as fbx or obj. Also Xmesh is very good to bake thinking particles geometry (also you can remap it!) actually only for max users, but if you buy it, you have access to a maya beta version. For me the export of baked animations is also vital. When it’s ready, I’ll buy this in a heartbeat. Hear it! In version 1.1 you can export from DM UI. Available on monday! In upcoming 1.1 all is renamed to english, and you can export from Demolition Master UI. You have diferent export options in TP, what do you want to do? With export operator you can export your mesh, you see diferent meshes because TP creates one mesh for every rule, and animate the visivility value in the right time. Is there an english version of DM Lite? It’s not very useful at the moment. Check DM Lite 1.1! Not only full english version. Also some features added, like gravity for bullets, secondary fragmentation for concrete, and debries for steel objects! Thank you Eloi for this great toll! Can you add a option for include debries in the export? Also please add caching controls. Right now I’m having a hard time optimizing for final bake. until I’m happy, the bake the final. I am wondering if i also can use this lovely piece of software in my daily production because i am not from a programming background. Could you please suggest if this is the right tool for the people who are not from the programming background or does this require the knowledge of coding and all? Of course yes! Is the purpouse of Demolition Master. You only need 3dsmax knowlade to use it. Please add TP5 Support !!! You can´t bought the old TP4 anymore, so it is useless for new customers. Thank you. Hi! I can’t try it with TP5 since I don’t have TP5 license right now. Some DM users says me that it runs pretty good on TP5. Others has some problems, but you only need to change VB and SC nodes from TP4 to TP5 and will run fine. Since some 2010 plug-ins work in 2009 edition, is Demolition Master supported even on Max 2009? My Bad, i discovered there is no backward compatibilitty between 2009-2010 plug-ins. So is there any chance to get Demolition Master compiled even for Max 2009? I have bought this and enjoyed it…..need more this as a an awesome Plugin! Hi! This plugin looks really awesome, will it be available for maya? Hey How to dfine the material or retain the UV in the debris and chunk. Please explain it. Is there going to be a Maya version? What a timesaver and fantastic stuff. How do you install it in 3DS Max 2013? Just watch the first video tutorial on “tutorials” section. As seen in tutorial after assigning Muti/Sub-object to a mesh and cracking it everything is ok.
My question is what will happen with it if I convert final TP demolition to a mesh in Max and export it to Maya, will materials assigned to cracks(new faces) stay on them? Yes, of course. id’s will be exported also. hello buy the product but I do not get anything for that email? hey, i bought it but im still using tp4, could you send me the tp4 version? What do you want, use an animated object to demolish something? You can or add your animated object as activator, or add your object to “Custom group object” rollout, track object to particle and send the objects to “deflect activator group”. The mesh of your object with interact and destruct everything, also if its a deforming mesh! I would pay 100 or 200€ if I wouldn´t need to buy Thinking Particles. Anyway, very nice job with this one. Well, the point is that you have already TP and you are looking for a quick way to destruct things. Thanks for the great tool. I am having trouble with something and perhaps you can help me. I have an animated object (also the object that needs to be destroyed). This is put into ‘concrete big objects’, made as instance. Now unfortunately the object stays staionary and does not follow the initial animation. I have tried changing the ‘track’ options to object to particle and initial velocity but unforunately to no avail. You can use moving objects to destruct things. TP has a limitation and if one object change from group loose “tracking motion options”, so for avoid this add your moving object to “Custom group objects”, send your object to the group “Deflect activator” and check “track motion”, now this object will move and destroy everything near him following his motion and deformation! DM its based in Thinking particles so of course you can cache your scene with TP, export it, or use third party meshcache solution like supermesher or xmesher. Colud you please tell us is there will be a new verdion of DM really soon??? Working on DM 1.5 new features! But I have to clean it, test it, and retest it, prepare documentation,… 1-2 month and will be ready! I just buy demolition master, but I have a big trouble. I use 3ds Max 2012 x64 and ThinkingParticles 4.0 SP3. Under “Bullet”, “Steel Properties” and “Stell Big Debris”, I cannot change the properties because the rollout is visible, but empty. With the mail used to buy DM. Thanks! I just bought the DM but is not working properly…I have TP4 but the version sent to my e-mail was TP5….is it the problem….I will need the version for TP4…. DM working with TP4 sended! HI! I download the Lite version and this is awesome!! But, I have a little problem with export o convert a single frame of damage… this is posible whit this version? HI! I download the Lite version and this is awesome!! But, I have a little problem with export o convert a single frame of damage… this is posible whitthis version?Thanks a lot!!! Support Max 2014 64bit ? Right now there is no Thinking Particles version for 3dsmax 2014, so right now, no. I’m enjoying the free version, however, it’s hard to use since edged faces are not showing up on the geometry once they’re inside Demolition Master. Do you know why they arn’t showing up for me? I’m using Max 2012 and TP 4.0. It seems like a problem with your videocard. Have you tried to change to direct3d or another? Ah, seems like it was a problem with the Nitrus viewport. Switching over to Direct3D solved it. Thanks for the help – I didn’t think to check that. your program looks very good and the price is affordable! One question though, I must TP for this to work right? If so, what is the minimum version of TP that DM needs? Oops, missed that line with the requirements. Yes, The best is use TP5.1. I can send you a version that works with TP4. But to use all the options is better TP5.1. Amazing plug. Will this work with the integrated TP action in 3dsmax2014? TP action? what is that? Is nothing related with Thinking particles. Everything is exported as geometry with baked animation on your scene. Just open the scene or merge everything in your actual scene. Hi , i have 2 question please answer me . 1- how or where from i can download it ?? 2- how to install it to 3ds Max ??? You need Thinking particles. And you can download from this page! does it work on ‘thinkingParticles 5 – Trial Version’? Acquired recently. Great plugin whether its further development? Still dobavat tutorials. I would like to understand the interaction of reinforcement, and soft bodies. There will be an update with the new TP6. Yes. If you have tp installed will work. Tested in 3dsmax 2014 and 2015 working perfect. On the Lite version….. how do you resize the opening screen? otherwise FumeFx requires a large container. Are you planning on incorporating the TP6 features? Hi! I`m planning to buy DM, but I have TP4, I wished to know what are the limitations using TP4? I suggest to upgrade to tp6, a lot of new and cool features! If you purchase it I can send you the version 1.5 that is working with tp4. You will not have bullet physics options, the procedural joint system and the proxys for simulations mostly. Hi! Thanks for the so soon answer! PS: I`m touched, you say you know me… a genious like you! I really admire you! Hi. First I would like to thank the creator of this useful program. I’m just getting a problem when using it on my 3dsMax 2014, The “error (10)” keeps on popping then the whole TP toolbars are gone. Please tell me what is the solution on this problem I’m planing to buy a full version though. Internal error (10)!!!! This keeps on popping up every time, i click on the TP right toolbar even not loading you DM. I think it damaged my TP installation. I’m using 3dsmax 2014. This really is devastating! How it could do that if it just a scene with presets? The scene doesn’t change anything about to installation. hi i am here just to thank you and to say you have misspell the word “necessary” ==> “necesary”! I’m using TP6 with max 2018 and DM 1.6 . I try to simulate glass breaking and other elemnts but seems to be super slow . I have a really powerfull machine but doesnt seem to work correctly. its there a special setup. I saw your demo with a labtop and was super fast im not sure what im doing wrong. For glass I will suggest you using bullet. is way faster than using SC! Let me know. Hi, is an upgrade to 1.8 free, if I previously bought 1.6? Version 1.62 or 1.8 says it was made with tp6.5 I don’t see realtime feedback with tp6.2 any help?